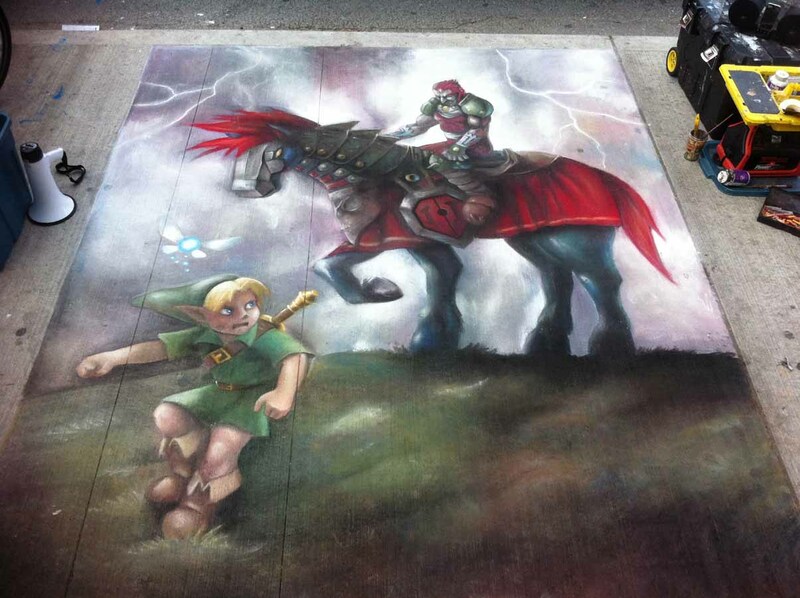 To celebrate the June 19 launch of The Legend of Zelda: Ocarina of Time 3D for the Nintendo 3DS﻿, veteran artist 'Chalkmaster' Dave took over the busiest intersection in Toronto to work on his latest masterpiece. His extraordinary chalk artwork was in production all day long as passersby looked on in amazement. The creation, commissioned by Nintendo of Canada, depicts Link's first confrontation with the Great King of Evil, Ganondorf, atop his mighty steed from Ocarina of Time﻿. 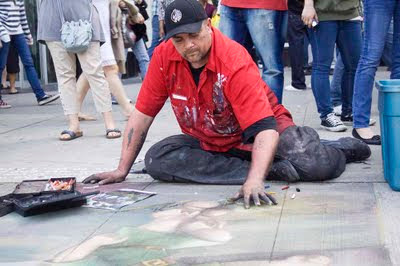 Dave is no stranger to pavement art, having started way back in 1981, and his passion has taken him all over the world to execute chalk art for corporate events and campaigns, festivals and busker fairs. During his more than thirty years of artistry he's created sidewalk art for The Matrix, Monopoly, Alice in Wonderland, Air Miles, Bell TIFF, National Ballet and many more. The all-day event drew the attention of thousands of people near Toronto's Eaton Centre as Dave made the game come to life with the life-size work of art. During production, which finished at 7:00pm, Nintendo of Canada snapped a bunch of photos (seen above and below) of the work-in-progress and final art. The final creation looked incredible and certainly did justice to what many critics consider to be one of the best games created ever. According to GameRankings.com, a recognized authority in game review score aggregation, The Legend of Zelda: Ocarina of Time is the best rated game in the history of video games, achieving an astounding industry average of 97.48%. The game has held the #1 spot ever since its release way back in 1998 for the Nintendo 64. A brand new 3D version of Ocarina of Time will be coming out in a few short weeks for Nintendo's 3DS handheld. This re-mastered version features enhanced graphics and new stunning 3D visuals that take full use of the Nintendo 3DS capabilities. While the core game has remained essentially unchanged, the control scheme has been updated to use the intuitive Circle Pad and Touch Screen interfaces of the Nintendo 3DS to assign items, equip Link and check maps. Players can also use the built-in gyro sensor while in first-person perspective to look around your environment by physically moving around the Nintendo 3DS system. What's also exciting is the inclusion of two brand new additional challenges not seen in the original game; Master Quest and Boss Challenge.﻿ In Master Quest mode the entire world of Hyrule has been mirrored so what was once on the left will now appear on the right. Puzzles will also have to be solved in new ways, items will be found in new locations, and enemies will be more challenging to overcome. This mode is sure to test the mettle of even the most seasoned Legend of Zelda fan. The new Boss Challenge mode is unlocked after players reach a certain point within the game and allows players to do battle with any of the previous Bosses they have defeated, or the option to fight Bosses one at a time in a continuous battle.